Do Easy is the third LP by Toronto-based band Tasseomancy. Together, twins Romy and Sari Lightman (vocals) along with Evan Cartwright (drums) and Johnny Spence (piano, synth) devise an album inspired by William S. Burroughs’s notion of “Do Easy” from his piece The Discipline of DE. Here, Tasseomancy take this philosophy — the belief that, to control our self-destructive id-like features, we must live in the easiest and most relaxed way possible — and transform it into a blend of prog-pop tinged with folk and goth elements. Ultimately, this synthesis of diverse sounds framed by Burroughs’s philosophy sets the album’s confounding yet hypnotic feel. Although it draws heavily from these ‘80s pop touchstones, Do Easy upholds an individual sound. With “Wiolyn,” Tasseomancy references a variety of distinctive genres. At first, the smoky sweetness of the Lightman twins’ vocals, paired with a satiny synth-driven instrumental, elicit similarities to a slowed down, eerier version of “You Keep Me Hangin’ On” by Diana Ross and the Supremes. Later in the album, “29 Palms” finds the Lightman twins choose to diversify their vocals by toying with enunciation and timbre. The idiosyncrasy crafted by the haunting voices and gentle ripples of saxophone sustains the album’s fanciful quality. 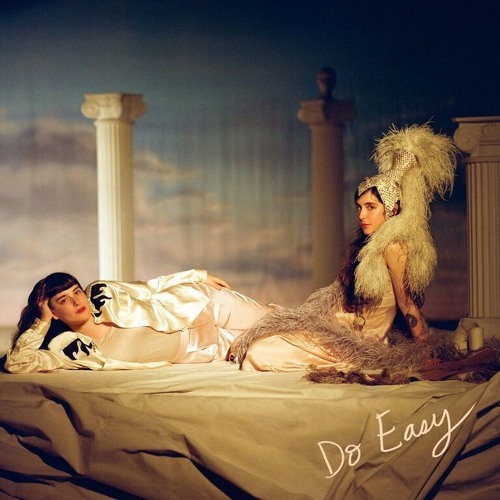 Throughout its entirety, Do Easy is a dance between ghostly and charming – a duality which is at the core of the album’s allure. With their languid yet wistful strain of prog-pop, Tasseomancy induce a calming reverie, capturing the relaxed state Burroughs’ philosophy promotes. If stricken with escapist yearning, then a listen to Tasseomancy’s Do Easy might prove to bring a most whimsical respite. This entry was posted in Reviews and tagged Do Easy, Soraya Mamiche Afara, Tasseomancy on January 27, 2017 by CKUT Music Coordinator.